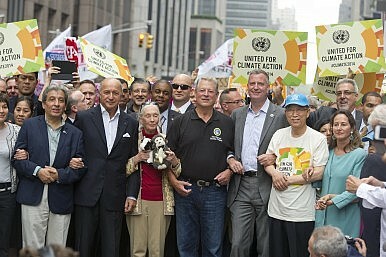 The UN Climate Summit convened Tuesday in New York, with Chinese president Xi Jinping conspicuously absent. In his place, Xi sent Vice Premier Zhang Gaoli as his special envoy. It would fall to Zhang to answer UN Secretary-General Ban Ki-moon’s call for global action on China’s behalf. Ban called for the Climate Summit as a way to jump-start political leadership and global action on the issue of climate change. With negotiations underway for a new climate agreement, Ban decided the global community needed an extra push. In his opening remarks at the summit, Ban emphasized that there is only one thing standing in the way of the necessary action on climate change: “Us.” “I am asking you to lead,” Ban told the attendees, particularly emphasizing the importance of “a meaningful, universal climate agreement in Paris in 2015.” Given the summit’s emphasis on leadership, those states whose leaders chose not to attend (including China) came under some scrutiny. The Climate Summit did include an impressive roster of political leaders, including U.S. President Barack Obama as well as U.K. Prime Minister David Cameron, French President Francois Hollande, South Korean President Park Geun-hye, and Turkish President Recep Tayyip Erdogan. Still, Xi was hardly the only leader not to attend either. Among the other noticeable absences: Indian Prime Minister Narendra Modi, German Chancellor Angela Merkel, Russian President Vladimir Putin, Canadian Prime Minister Stephen Harper and Australian Prime Minister Tony Abbott. Unfortunately for China, Xi’s absence was particularly noticeable as Zhang Gaoli was only several speakers removed from Obama. With that in mind, what new commitments did China bring to the table? The biggest concrete commitment was China’s pledge to provide $6 million to promote South-South cooperation on climate change. In addition, Zhang announced that China would double its annual financial support for the South-South cooperation fund on climate change. Zhang also repeated previous government assertions that China is on target to reduce carbon intensity by 40-45 percent from 2005 levels by 2020. Zhang’s speech reflects the general pessimism that accompanied the news of Xi Jinping’s absence from the summit: If China had truly important measures to reveal, it would not have sent a vice premier to make the announcement. Instead, the world will likely have to wait for China’s 13th Five Year Plan (to be adopted in 2016) to see just how serious Xi’s government is about climate change. Despite its vocal commitment to a “war on pollution,” Beijing is especially wary of drastic environmental protection measures at the current time. China’s economy is already vulnerable as China’s leaders try to guide a wholesale shift away from the current growth model. Given this, Beijing is not keen to take on new economic stressors. Instead, Beijing continues to insist that its “national conditions and capabilities” should exempt it from taking on too much responsibility in the fight against climate change. An op-ed in Xinhua hammered this point home. Ever since China passed the U.S. to become the largest emitter of greenhouses gases in 2007, analysts have argued that China should take on more responsibilities in the fight against climate change. Xinhua shot this argument down as “untenable” given “both historical facts and present reality.” The article holds fast to the old argument that China has every right to place emissions cuts on the back burner while it focuses on economic development. “It is extremely unreasonable and selfish for those developed countries, which have emitted their historical share of greenhouse gases and are relocating their current share, to pass the buck to developing nations and infringe their very right of development,” Xinhua said. This tug-of-war over the responsibilities of developing nations that are also heavy polluters continues to weigh down climate change negotiations. Developing countries (including but by no means limited to China) complain loudly that the developed world has not lived up to previous commitments to provide monetary and technological assistance to help poorer nations combat climate change. Meanwhile, many developed countries, led by the U.S., argue that heavy polluters like China and India should also be required to cut emissions. During his trip to the Climate Summit, Zhang repeatedly stressed China’s position that “common but differentiated responsibilities,” the hallmark of the Kyoto Protocol, should still be at the core of 2015’s new climate change agreement. He emphasized this point both in his remarks at the summit and in a separate meeting with Sam Kahamba Kutesa, the president of the current session of the UN General Assembly. Still, Zhang also assured Secretary-General Ban Ki-moon that China and its leaders “attach great importance to the issue of climate change.” In return, Ban Ki-moon “stressed the importance of China demonstrating its leadership around the goal of concluding the climate change negotiations by the end of next year.” 2015 will provide the real test for China’s (and the world’s) commitment to stopping climate change. China Paves Way for Slowing Global Emissions Can China Put a Cap on Coal?Top Leaders From China, India to Skip UN Climate Change SummitIn Climate Change Breakthrough, China Will Cap EmissionsDoes China Still Want to Be a Global Environmental Leader?